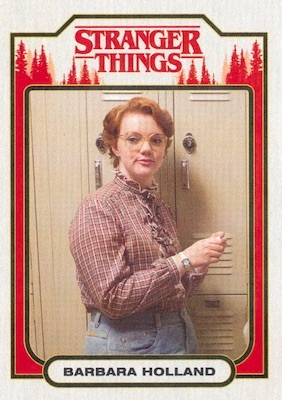 Things are about to get a little spooky with 2018 Topps Stranger Things Season 1 trading cards. Hobby boxes contain two hits from autographs, relics and sketch cards. 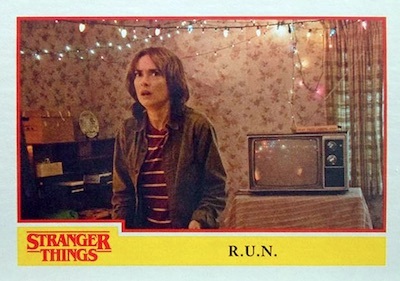 As the debut card product for the breakout Netflix series, the licensed set features a detailed base lineup alongside several inserts and autographs. Season 1 of the sci-fi/horror show released in the summer of 2016 to widespread acclaim. The set for Season 2 is planned for 2019. 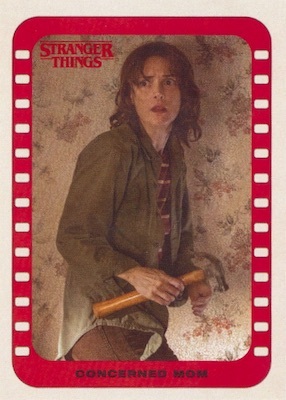 Chronicling the strange occurrences in Hawkins, Indiana, and the group of young friends caught in the middle, the 2018 Topps Stranger Things Season 1 checklist contains 100 cards in the base set, which is done on Heritage stock. That naturally means cardboard coverage for best friends Mike, Will, Dustin and Lucas, plus the mysterious Eleven. 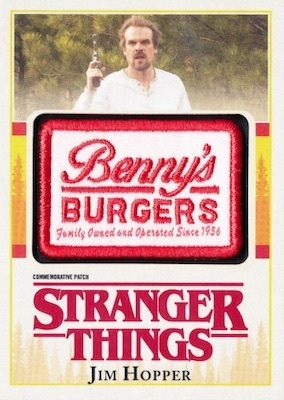 Parallels are unique to the series, including Upside Down (#/99), Waffle (#/11) and Christmas Lights (1/1), plus Printing Plates (1/1). 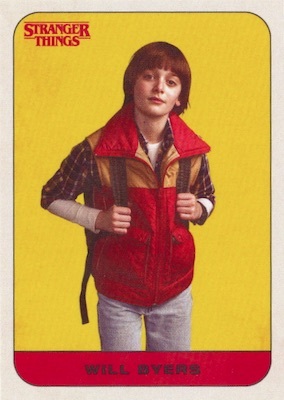 Season 1 inserts increase the set build via Character Cards (20 cards), Character Stickers (20 stickers) and Stranger Things Scene Stickers (10 stickers). Likely to be very exciting for fans, the release has Autograph cards featuring cast members. Along with Orange (#/99), Green (#/50), Purple (#/25), Blue (#/10), and Gold (1/1) parallels, there are also Dual Autographs numbered to 10 copies. Another hit option, Commemorative Patch cards come one per retail blaster box but are not exclusive to this format. These have the same parallels as the autograph cards and add a signed version that is numbered to 10 copies. 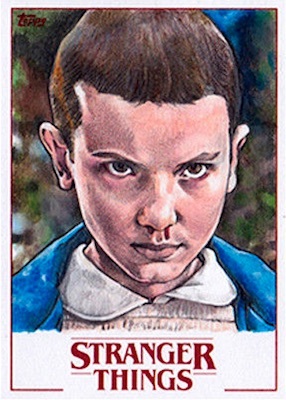 Buy Stranger Things Season 1 boxes direct from Topps. PARALLEL CARDS: Upside Down #/99, Waffle #/11, Christmas Light 1/1, Printing Plates 1/1. 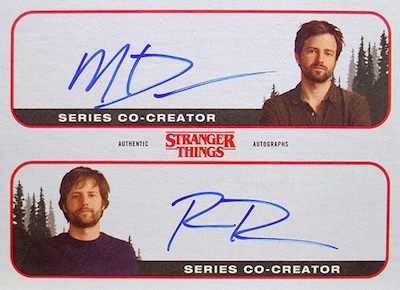 Buy Stranger Things Season 1 autographs on eBay. Chester Rushing as Tommy H.
154 artists. Serial numbered 1/1. Looks great. My daughter will love them!!!! 80’s style base-set was a good idea but not executed very well. 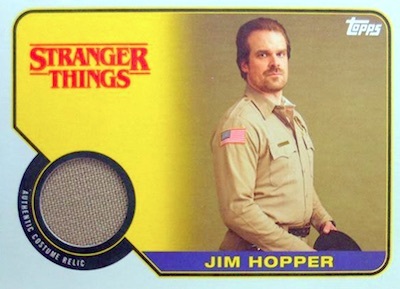 Looks like Topps found the ugliest 80’s release style they could find. Patches are stupid, stop making them as filler to crank out more cases than you should. Autograph line up really weak. Even pop century managed to get all the major characters to sign. The Relic and Character Cards were really nice. A great title wasted by a poor Topps effort. From the 4 boxes I purchased, I got 2 autos (David Harbour Green Parallel Redemption and Duffer Bros Dual Auto) so I was very pleased with that. I enjoyed the cards themselves and the character cards, although I fell one shy of completing the character card subset. On the down side, not having all the major characters signing was a minus. I’m not a fan of the sticker and patch cards so if they remove them from the Season 2 cards (which I assume there will be at some point). Also to put on the sell sheet dual and triple autos but only end up with 1 dual auto and no triple autos was disappointing. obviously they could have gotten some more signers. 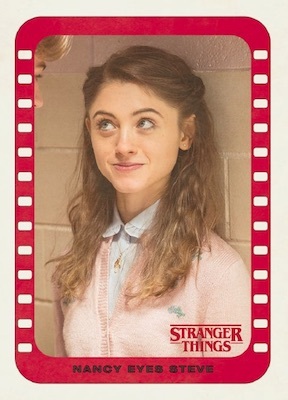 Never expected them to get Winona Ryder or Matthew Modine but to be missing Finn Wolfhard, Caleb McLaughlin, Natalia Dyer, Charlie Heaton, Shannon Purser is a bit weak.